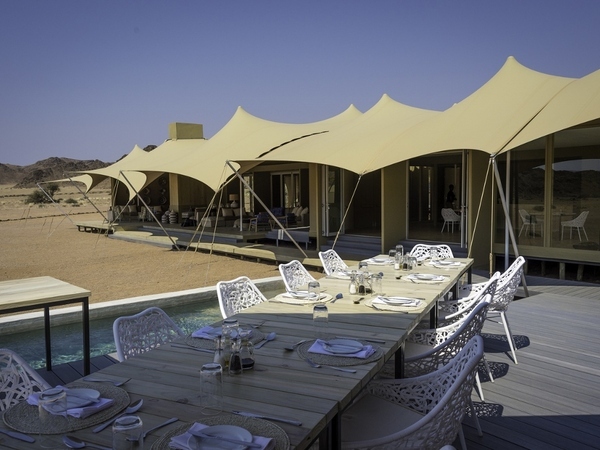 Hoanib Skeleton Coast Camp lies within the Palmwag Concession at the edge of the fabled Skeleton Coast. 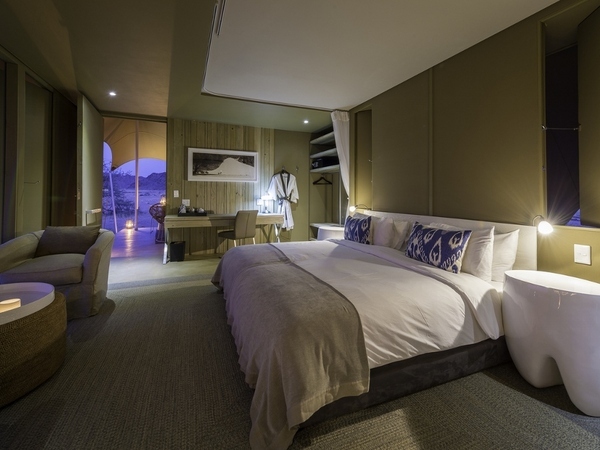 This area is known for Africa's greatest population of desert-adapted elephants, as well as the elusive brown hyena and Cape fur seals along the coast. 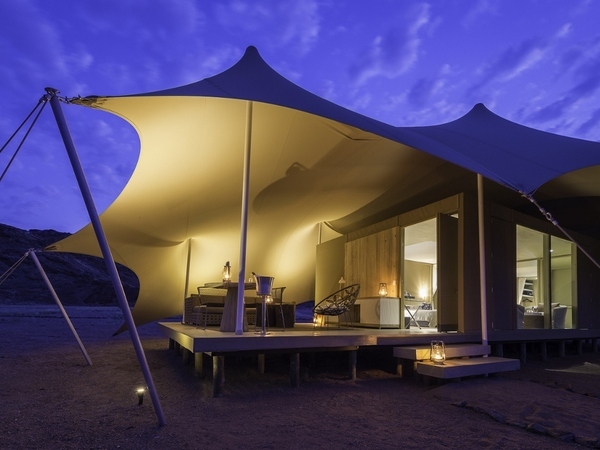 Hoanib Skeleton Coast Camp is truly one of a kind. Highlights are seeing the desert-adapted elephants and elusive brown hyena. 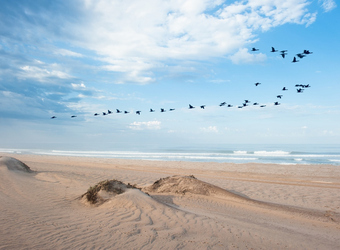 On a stay of three or more nights, you can enjoy a flight over the Skeleton Coast. 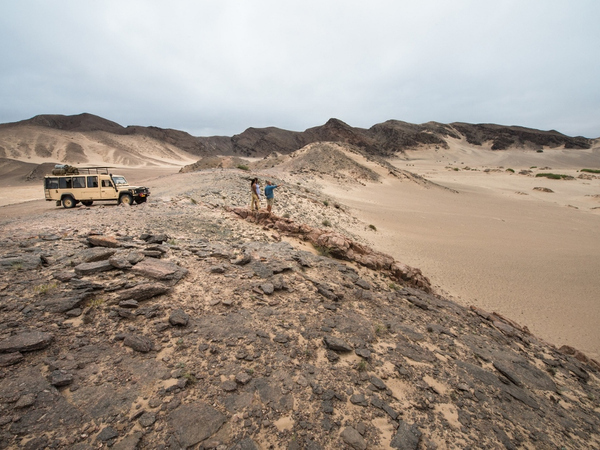 It's a full day of sights like the rugged coastline, seal colonies, shipwrecks, as well as massive dune fields, the Auses Spring and the Hoanib floodplains. 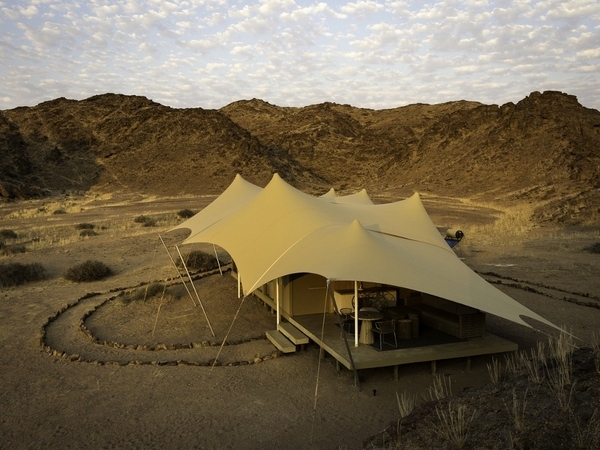 Hoanib Skeleton Coast Camp lies in a scenic valley at the confluence of two tributaries of the dry Hoanib River. 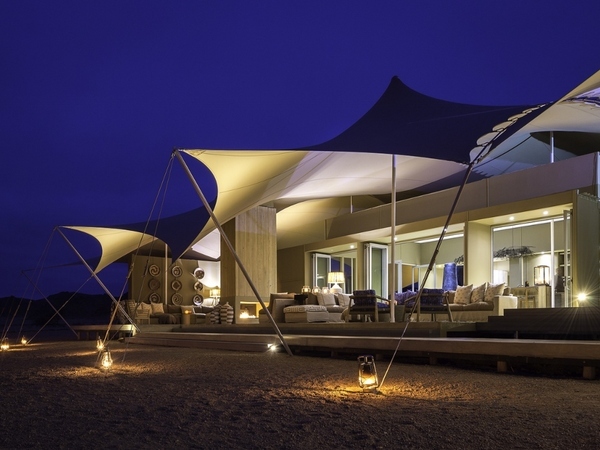 Its location, set within the northern Palmwag Concession, abuts the iconic Skeleton Coast National Park in one of the most remote areas of the Kaokoveld. 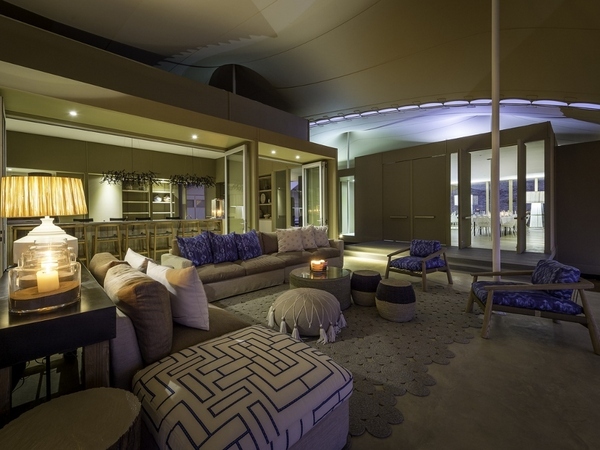 The exclusivity of this area is undeniable, as the camp is accessible only by light aircraft and consists of just eight spacious tents, including a family unit. 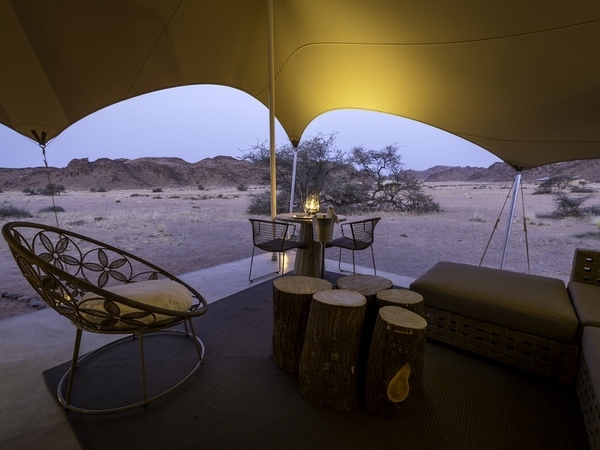 Each tent has a comfortable bedroom with a view of the desert through glass doors, a small desk and sitting area, an en suite bathroom with hot and cold running water, and a private veranda that forms an outdoor living area with plush seating and tables. 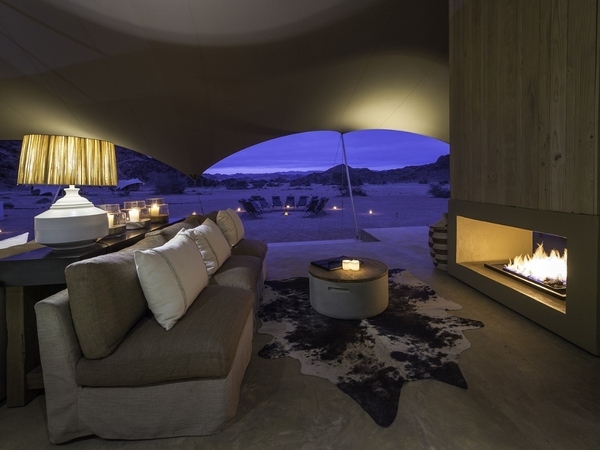 The camp mimics the desert with draped canvas evoking the appearance of sand dunes, and living areas in earthen tones that create a flow of space to the outdoors. 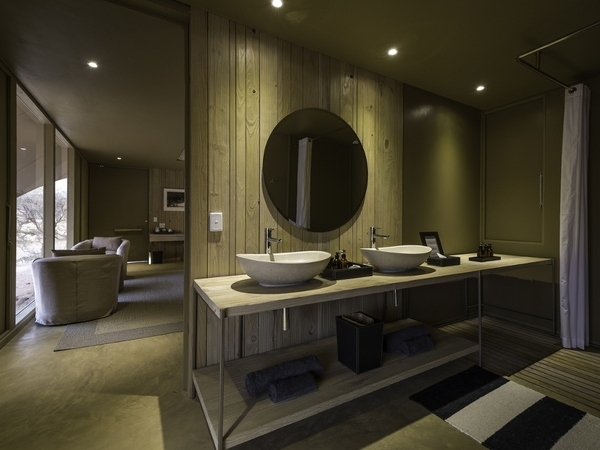 The central living and dining areas are spacious and also feature a lap pool for a cooling dip at midday. 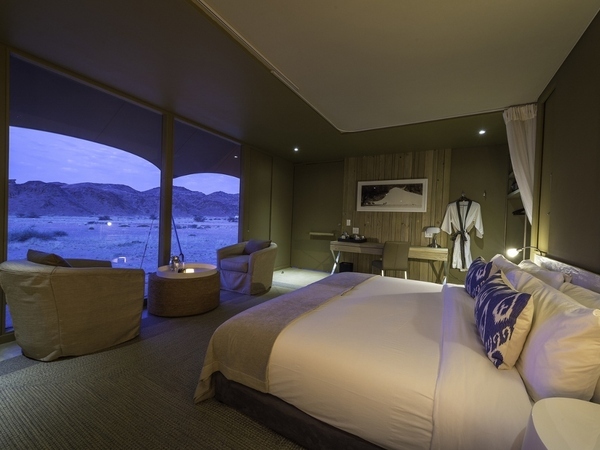 The camp overlooks rugged hills on either side and blends seamlessly into its environment. 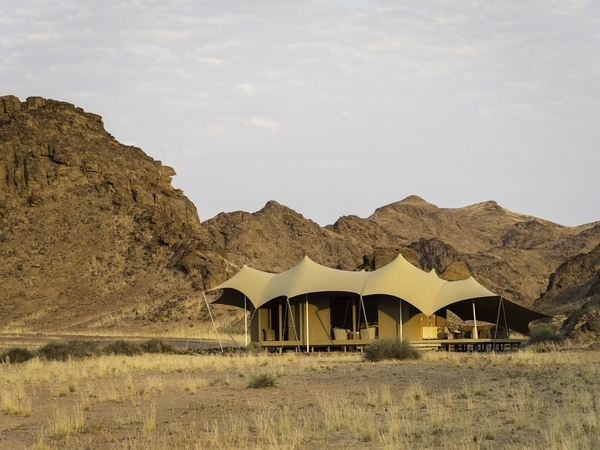 Within the Namib Desert, bordering Skeleton Coast National Park, Hoanib Skeleton Coast Camp exhibits unique viewing opportunities for desert-adapted wildlife and access to some of the most vast and remote regions of Namibia. 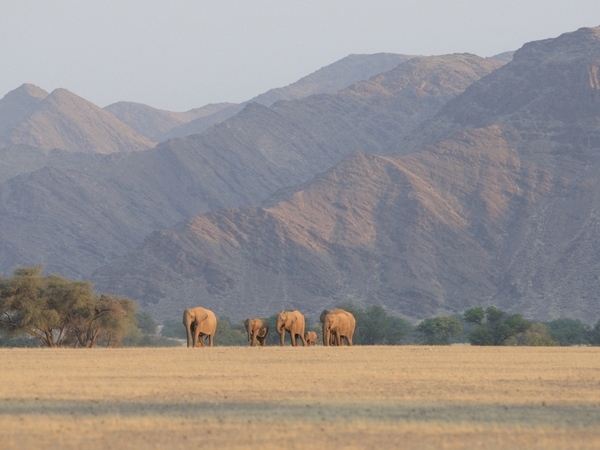 Desert-adapted elephant lumber through the valley beneath rugged hills. Giraffe, springbok, gemsbok (oryx) and steenbok thrive here. 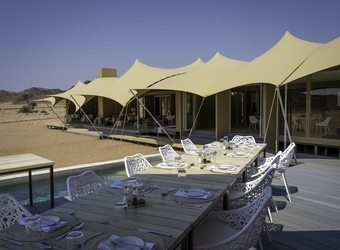 Guests may also see ostrich, scrub hare and ground squirrel, with occasional sightings of lion, black-backed jackal and brown hyena predating or scavenging in this stark environment. 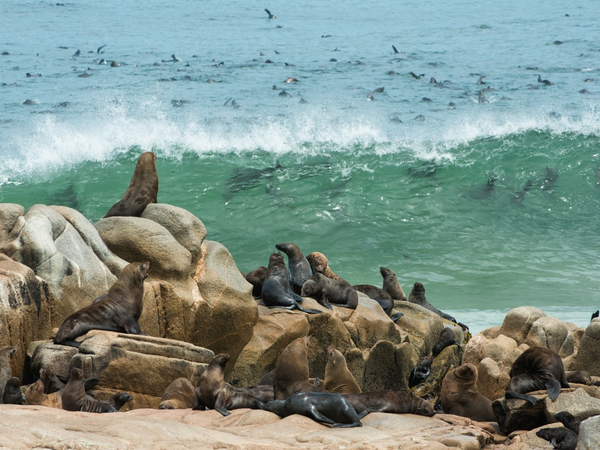 Along the coast itself, we find colonies of Cape fur seals by the thousands. 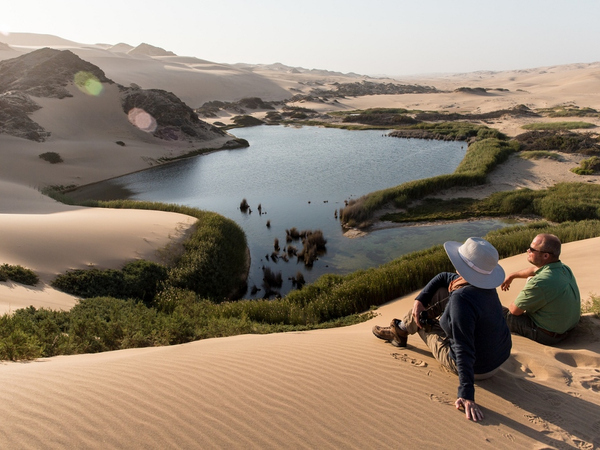 Birding varies from the interior to the coast, with Rüppell's korhaan, Benguela long-billed lark and lark-like bunting nearer to camp, while tractrac chat, jaegers and skuas are present along the coast. Daily wildlife drives take place each morning and afternoon, and interpretive nature walks are especially unique within this desert ecosystem. Major wildlife sightings for the Skeleton Coast can be seen below. 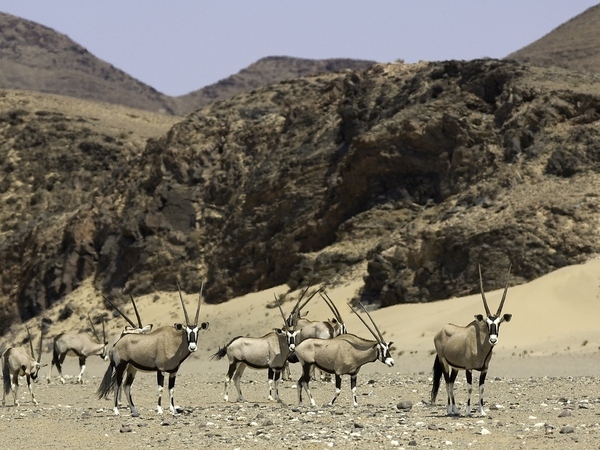 Though not considered a dense wildlife destination, the desert-adapted elephant, gemsbok or oryx, springbok, ostrich, giraffe and the occasional lion and rare brown hyena can be viewed, which massive colonies of Cape fur seals bask along the coast itself. 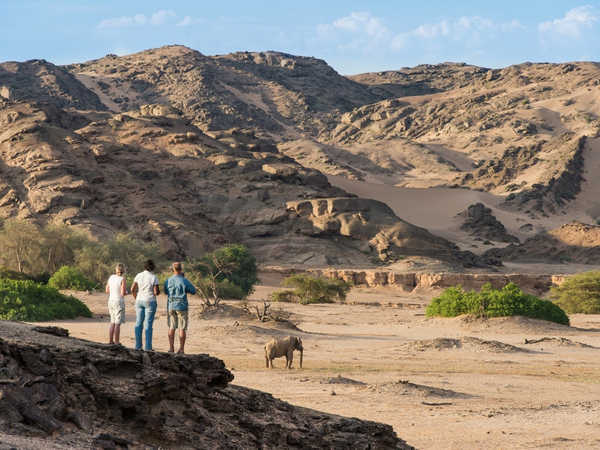 The Palmwag Concession is a joint venture with the neighboring community-based conservancies of Anabeb, Torra and Sesfontein. 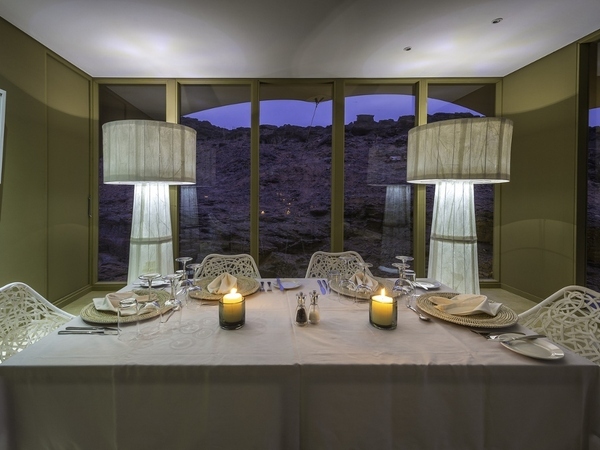 Inside Palmwag, Hoanib is situated within one of the world's most fragile ecosystems and has been built with a minimal footprint, imposing the least amount of impact on this delicate environment. The camp is 100-percent solar-powered and employs water reclamation systems to break down gray water to be reused by plant life. A population of desert-adapted lions, which are still relatively elusive, is supported in the surrounding environment. Through years of conservation, the desert lion is becoming more prevalent throughout the harsh areas of the Namib Desert. While there is still a level of conflict between lions and the local people, a tourism partnership allows the community to benefit from ecotourism activity, encouraging protection of the wildlife and mitigating human-wildlife conflict. 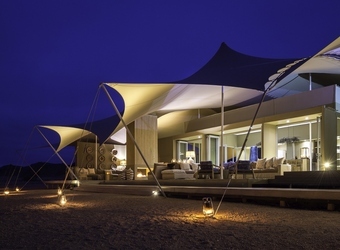 When did you visit Hoanib Skeleton Coast?